Turkish perspectives on re-establishing diplomatic relations and rapprochement vary greatly depending on region. 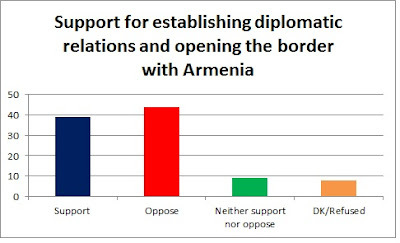 The greatest level of support for re-establishing diplomatic relations with Armenia comes from those residing in South East Anatolia, with 59% of respondents expressing their support. The most opposition comes from those residing in the Black Sea region, with 60% of respondents expressing their opposition. Respondents from South East Anatolia also express the greatest support for economic, political and cultural rapprochement with Armenia; 62% of respondents support economic rapprochement, 60% support political rapprochement and 60% support cultural rapprochement. Respondents from South East Anatolia appear to support across the board reconciliation with Armenia, while those from other regions are more mixed in their attitudes. Regarding attitudes towards European Union membership, 69% of respondents want Turkey to join while 26% are opposed to joining. The main reasons for supporting EU membership are the easing of visa restrictions and economic benefits. Worth noting is that respondents, by a large number, feel the greatest obstacle to EU membership is Europe’s Islamophobia. When asked about the United States, over half (52%) of respondents feel the US is unfriendly towards Turkey, the primary reason for this being that the US thinks only of its own benefits. Despite this, more than half (53%) of respondents feel the future of relations between Turkey and the US will be positive. Turks have very strong opinions on foreign policy in the Middle East. 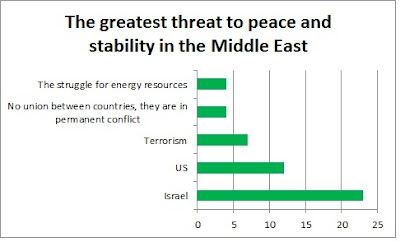 Respondents feel that Israel is the greatest threat to peace and stability in the region (23%), followed by the US (12%) and terrorism (7%). Many Turks feel that Turkey could be a model for other countries in the Middle East, politically (72%), economically (80%) and culturally (82%). Three quarters of respondents support Turkey playing a role in solving the Israeli-Palestinian conflict. Akgün M., Gündoğar S.S., Görgülü A., Aydın E.E. 2011. 'Foreign Policy Perceptions in Turkey', TESEV.